TestRail is an intuitive application which provides users with superior levels of clarity and oversight when testing software applications. TestRail has been designed to support any method of software testing, such as manual testing, exploratory testing, and automated testing. It is highly efficient and fully scalable. A free trial version is available which offers easy cloud-based setup just minutes, or download to a private server. TestRail boasts a comprehensive suite of utilities which are perfectly suited for development & IT professionals. However, its straightforward nature is just as appropriate for those who possess only a moderate amount of experience. The main benefit of this solution is that all results can be tracked in real-time via a centralized dashboard. Timelines may likewise be selected and color-coded test results (passed, blocked, retested and failed) make diagnosis a cinch. Such graphical representations are also excellent in order to ascertain longitudinal progress over time. It is also possible to access this application via a personal web-based server or through the official TestRail hosting platform. The agility of this system is likewise impressive, as it can handle heavy workflows and it is capable of supporting large IT teams (more than 1,000 members). It is therefore suited to handle one-off projects as well as massive software implementations. An interesting addition known as the FastTrack layout incorporates three panes of information into a single screen; providing users with single-click results as well as second-to-none levels of proactive oversight. IT professionals will appreciate the UI that has been incorporated into TestRail. Not only does this interface provide clear graphical results, but different metrics can be accessed with a single click. This takes the guesswork out of projects that could otherwise be extremely complicated. Team-based interfaces are another useful addition to its overall layout, as the correct stakeholders will be able to make adjustments at the appropriate times. Of course, all progress can be archived and milestones can be examined in order to appreciate the "bigger picture" or to keep clients abreast of the project as a whole. Top-down functionality is likewise beneficial for team leaders; offering options such as verifying that the software has met predetermined requirements and highlighting any additional steps which the project may require. TestRail can be the perfect software addition for those who have been looking for an agile and professional test management suite. The inclusion of a free trial period is a nice touch which should prove useful when determining its overall efficacy. Both cloud- and server-based editions are available and flexible pricing packages are available. The fact that a handful of customers include FedEx, Adobe and Amazon utilize this service illustrates its sheer versatility. 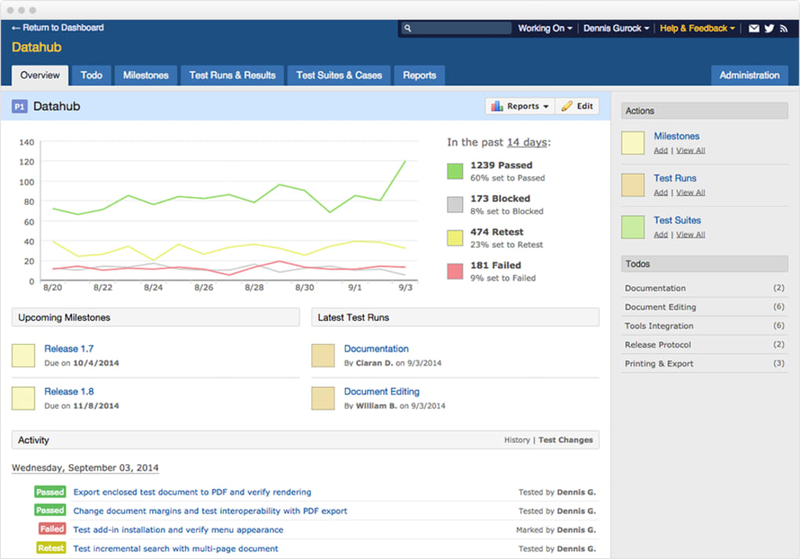 Boost your software testing productivity with web-based, scalable test case management for QA and development teams. Document your manual and automated test cases; then organize them into test suites and sections. Schedule test runs, assign tests to users, generate personalized to-do lists, and send email notifications. Capture real-time results from testing. Track progress towards milestones with informative dashboards, metrics, and activity reports. Compare the results of testing to historical results. Integrate TestRail with your issue tracking, test automation, or continuous integration process. TestRail is highly customizable and supports cloud-based or on-premise installation. TestRail is highly flexible and customizable. You can use it for any type of testing, including session-based exploratory testing and automated testing. You can define custom fields for test cases and results, create custom user roles, and set up custom statuses for your tests. TestRail integrates with leading tools including Confluence and Jira. Or, use the open API to create your own custom integration. TestRail’s user interface is fast and lightweight, easy to learn and use. But it is also powerful with advanced features for the most demanding use cases. Best of all, it’s reliable and stable. Choose cloud-based installation for fast setup with no IT required, or on-premise installation on your own server. Free 30-day trial available. What do you think about TestRail? Do you recommend it? Why?